← Some brief notes on “Pure rationality”. It’s time to share a story. I grew up with parents who themselves grew up identifying as “Working Class”, and so I internalised the value of hard work. By the time I was 25 I had had twelve separate jobs, with the only break being a few months while at university and not also working, and a month or two between temping roles. I always performed well and was never sacked; either I had to leave to move, or the role itself simply came to an end. My father considered me lazy due to having had so many jobs. As I said to him then, things have changed since his time. Living in London I was never rich. When I did have surplus income, it went to pay off student debt. After this, I had enough to stand my round at the pub, and that was about all. My girlfriend at the time used to be homeless, and so due to her experiences I was terrified of being homeless. I stayed in an unhappy and unhealthy relationship for too long out of fear, and in the end she threw me out. Initially being unemployed was not so bad. I found somewhere to live, which was covered by housing benefit and £10 per week of my JSA. The room was tiny, perhaps 8 feet long by five feet wide, but it was mine. As it was such a poor area, I was able to feed myself for a week for between £8 and £10, mostly eating pasta with a little protein, stew, curries. I volunteered for Citizens Advice, who paid my travel costs, let me snack on food brought in by paid staff, and insisted on not letting me pay for a round at the pub. I had one or two better-off friends who would occasionally treat me to a meal in Soho. Most of the rest of my £50-odd per week went on travel. This was in 2009. Since then, travel costs in London have soared, rents have increased, housing benefit has decreased, and soon no under-25s will be able to claim housing benefit at all. When I claimed JSA for the first time, I received a letter stating that the £1000 of tax I was then owed would be taken from the JSA I was paid, on a one-for-one basis. When I researched this at my advice bureau, it appeared to be legitimate. I was outraged by the unfairness. Yet this isn’t the last unfairness I faced. Later that year I got a job. I worked part-time for another advice agency. As in every other adult job I had had, I was put on an emergency tax code. This meant that tax was taken at a flat rate of 20%. In theory, the emergency tax code means that you receive your personal allowance of tax-free income over the year. In my case this has never been what actually happened. I did not receive any personal allowance, and was taxed at 20% on all my pay. That year was a very cold winter. I was only working part-time, and travel costs ate up a huge amount of my pay. I worked extra hours in order to try to make ends meet, but in the end, after bills, rent and council tax, and travel, I had less to live on than when I received JSA. As the weather got colder, I found that I couldn’t afford to heat my room, so, as I had done in Scotland, I wore more and huddled under blankets. Every month I would ask my manager to sort out my wages, and every month she would claim that next month they would be sorted. Nothing ever changed. With my unheated room and walking to work through the snow, I got sick and was sent home one day as I couldn’t climb stairs. For a short time I could barely walk, and had to rely on flatmates to deliver food. I tried to return to work, but I still was unable to manage the stairs. I was terrified. All I wanted was to get well. I was lucky to receive ESA. On ESA I had more money than I had ever had in my life. Not only could I afford to heat my room, I could afford to buy clothes that fit me properly, and I could occasionally travel to see friends. As ATOS cracks down on more and more claimants, this will be an opportunity for recovery, for a decent life, open to fewer and fewer people. I was lucky in being the kind of sick the system is designed for, designed to force people to be. Over time, and with warmer weather, I recovered. Once properly well, I got a discounted gym membership, one of the last group to do so before many London boroughs effectively abolished discounts for those on benefits. (When I became a student, and was offered a bigger discount than ever while those on benefits received limited hours and a tiny discount). Back to that 20% flat rate of tax. I am certain I am not the only person to be taxed on all of their income. Since returning to university I have talked with far more people, and found my situation was hardly unusual. Activists across Europe, across the world talk of “the Precariat”, of precarious work, short-term contracts, constant insecurity. This was my experience, as part of the new working class. Precarious work, on emergency tax code, thus being taxed at 20% on all my income, and always scraping to get by. The new working class, same as the old working class. I also know quite a few people being paid a lot more than I used to be, when I sat below the poverty line. And I learned one stunning thing: these people are not paying very much tax. One standard trick now used by both public and private sector employers – indeed, the NHS now employs many contractors this way, although it is increasingly difficult to distinguish between working for the NHS and a private company – is to have people set up their own company, work for it, and receive part of their pay as dividend, thus avoiding paying both higher rate tax and some National Insurance. I’m not an accountant. Tax and National Insurance are complicated, and change year on year. I welcome comments. Still, it is possible to make some back of the envelope calculations. For those using the employed-by-own-company trick, generally it is better to receive up to around £25k as wages, and the rest as dividend. Knowing this, it is possible to look at the working poor, and at the working rich, and to make some rough calculations on the rate of tax and NI both are paying. For someone working full-time at minimum wage, their income is around £12k per year. They thus pay just over £500 in national insurance. If they are being taxed on emergency code they will be paying roughly £2000 in tax. Of course, most people doing precarious work do not work for a full year. If they work for a full year, they have to be treated as employees under employment law, and acquire more rights, though of course David Cameron is trying to change this. Generally, people doing precarious work will work for most of the year, and have periods on JSA and on Housing Benefit. They will struggle to bridge the gap between work and benefits – there is usually a significant delay before benefit is paid, and housing benefit is paid four weeks in arrears. Of course, this assumes that they were let go, and that they were not held by the DWP as deliberately leaving work – in that case, no benefit for them. Thus, even in the best case scenario of being eligible for benefits they will get into debt and end up paying interest and charges to cover this period. Moving back into work causes a similar delay. There used to be a four week run-on for housing benefit for those unemployed for six months or over, to ensure they could pay the rent while waiting for their first paycheck. This is now being phased out. In any case, our theoretical (very lucky!) precarious worker is earning £9500 after tax, and paying £2500 as tax and NI, some of which they may, if they understand the system and claim it before three years elapses, get back. This is a tax rate of 20.8%. Thus, they are being taxed at a rate of 19.8%. Now, let us take someone earning a fairly reasonable rate of £180/day as a “self-employed” contractor. They work 5 days per week, and 48 weeks a year – bank holidays and all that, and everyone needs a few (unpaid) days off sometime. This works out as £43,200 before tax. Above 25k they take their wages as dividend. So that’s 43200-25000 = 18,200 as dividend. On that dividend, they pay a flat rate of 10% up to 34,370 of total annual income. (http://www.nidirect.gov.uk/tax-on-uk-dividends) After 34,370 they pay 32.5%, up to 150k. So that’s 10% of 34,370-25,000, or 10% of 9,370, so £937. And finally 32.5% on the rest of their income, on 43200-34370, on the remaining £8830. 8830×0.325 is 2869.75, so a not inconsiderable £2869.75. So they are paying 2088.96+3379+937+2869.75 total, so £9274.71. Thus, they are being taxed at a rate of 21.5%, only slightly more than the person on £12k per year. Still, our people working as consultants have several privileges that precarious workers don’t. They have enough income that they can save a buffer, meaning they won’t be dependent on fickle benefit payments to cover the gaps. They can afford a mortgage rather than rent, bringing their housing costs down. They will pay the same in council tax, or a bit more if they choose to live alone. They will pay the same for heating, probably a bit less, as owners can get grants and ensure their property is properly insulated, and receive monthly bills rather than use more expensive token meters. They can pay less VAT overall. (Compass think-tank produced a fair report on the overall regressiveness of the UK tax system here.) They can choose where they live. Their lives will be lived with far less stress, ensuring they can make good decisions (chronic stress restructures the brain, leading to bad choices). They can escape the feeling of inescapable grinding poverty, and the barrage of newspaper headlines about benefit cheats, entitled scum, and so on. In general, everything will be financially and emotionally much better. Not so for those doing precarious work. Not so for me. Now while on JSA I might now be instructed to work for free, or lose my benefit. If I can’t afford the rent, if under 25, I will in future have to return home, or, if estranged from my family, like many queer and other youth, become homeless. I would have had to choose between that unhealthy relationship and the street. At least in prison, you have a heated room and food. At least in prison, your labour is not generally exploited to make others rich, though in moves led by the US this is changing. It is becoming more and more clear to me and to others that work simply does not pay, or if it does, it pays only the wealthiest. Marx may not have been right about a coming dictatorship of the proletariat, but he was certainly right about the extraction of surplus value from workers to benefit a tiny, wealthy class. right to work oneself into an early grave, to freeze, to starve. The soaring number of food banks in the UK is no coincidence. It is a taste of things to come. In 2011, when the riots happened, I felt genuine fear. But then I thought. I thought, what if those young people had not only gone through what I went through, not only absorbed the neoliberal lies I had been told, but experienced racism, experienced endless stop-and-searches too? Can you still blame them? Or can you begin to imagine a world where taking things makes sense, when those things can be exchanged for heating, for food? What has happened in the UK is that we have become a society divided against ourselves. Left and Right are both weak, and in parliament almost identical. The older hate the younger, seeing them as feckless, when working culture has changed entirely. The working poor suffer, and stew, and grow angrier, and do nothing. Those on moderate incomes despise the poor, who they see as benefit-scrounging cheats. The working rich see their success as down to themselves, and devil take the hindmost, for have they not sacrificed much – as contractors, they can be hired and fired at will, unlike staid long-term-employee types. Almost everyone sees things as a matter of individual choice, rather than systemic failure and historical consequence. I rather doubt some marxian revolution lies ahead. What I fear lies ahead is some repeat of the darkness of the 20th century: the tearing apart of social relations, but not this time between countries, but between rich and poor, between the political class and everyone else. The 20th century saw brutalisation on a mass scale that led to it becoming the century of industrialised death. Revolutions were armed, counter-revolutions were certainly armed, the systemic problems of Germany, of Russia, and of global capitalism were never resolved, and the result became mass slaughter. What we are seeing now is a different kind of brutalisation. Under the rhetoric of “individual choice”, antiquated morals evaporate, but so do human structures and human feelings. Every day in London we all walk by a massively increased number of homeless people, barely noticing them. Soon the mass evictions will happen, to force out the “undeserving poor” (http://t.co/K1qr2dWU). It may be, with the soaring numbers of council evictions, that this is happening already. Yet to get by day to day we must be perfect selfish individualists, forcing our way to the front with style and aplomb. I personally feel like a fool for having believed in a social contract or working to directly help others at all. There is only actions, and consequences, and power. I do, however, fear for our and therefore my future. What individual choice, what “rational incentive” are we offering the working poor, but to kick off? What incentive do the rich have, except to exploit more, except to turn a blind eye to more? 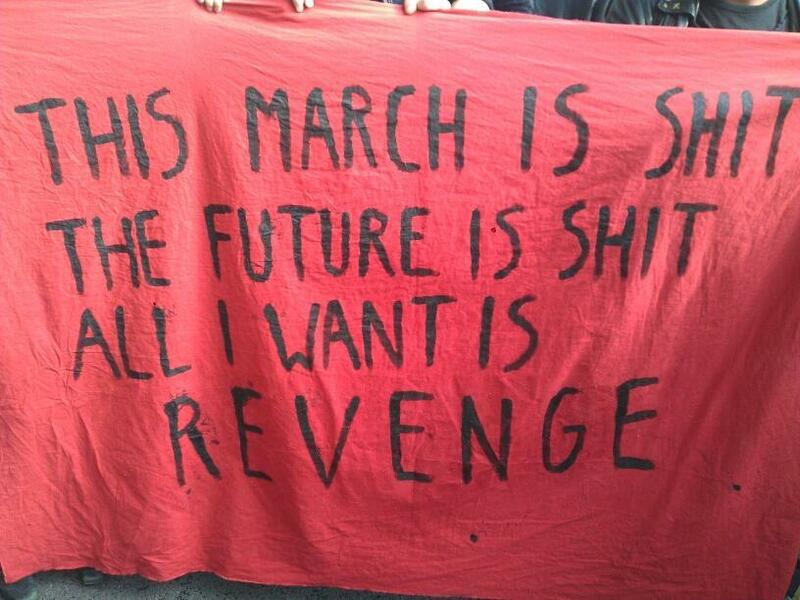 When I saw this banner on the October TUC march, I felt both thrilled and repulsed. Through writing this, I realised that I agree with it completely. More will feel this way. I only hope that a way can be found, or made, to avoid the coming darkness ahead. Never has that question “Socialism or Barbarism” seemed more apt than now. Thank you. For writing this.